Inductive loop vehicle detection is still the most reliable and cost-effective method of vehicle detection in today’s traffic and parking applications. The electronic circuitry in the Diablo Controls vehicle detectors is very reliable and we control our production and testing very tightly. This assures the customer of getting the most reliable electronic package available. But this is only part of the story. The proper installation of the loop system is something for which the installer must take responsibility, and indeed, is the key to reliable vehicle detection. It has been the experience of most agencies and installers that a properly installed loop system should last the life of the roadbed. The loop “system” includes the loop wire in the street and all of the feeder cable back to the detector unit located at the gate operator or traffic controller cabinet. The loop wire to be installed in saw-cuts, should be #18 AWG or larger, stranded and tinned copper wire. We recommend the use of at least #16 wire for mechanical strength. Good wire is typically inexpensive compared to the re-work expense if a failure occurs. Cross-link polyethylene (XLPE) insulation with a voltage rating of 600V is the wire to use if a cold sealant is used. If a hot tar sealant is used then a cross-link polyethylene with an additional polyester jacket should be used, also with the 600 volt rating. Cross-link polyethylene wire is recommended over PVC insulated wire or nylon jacketed wire such as THHN or TFFN. One of the most important parts of the loop installation process is the saw cut. The pavement is typically cut to a depth of approximately 1 1/2 to 2 inches using a 1/4 inch wide blade. The slot is then cleaned with water and then blown out with compressed air. This will assure that all sharp particles are removed from the slot. The corners of all square or rectangular loops should have 45 degree cuts to prevent sharp corners from puncturing the loop wire. Start the 45 degree cuts about 8 to 12 inches from the corners of the loop. The turns of wire are then installed in the bottom of the slot and held into place with foam backer rod (See figure 2 ). This will assure that the wire is held in place when the sealant is added to the slot. Loop wires should be twisted at least 6 turns per foot from the point where they leave the loop and start toward the side of the roadway – down the lead-in slot. The sealant used in the loop and lead-in slot should be pliable and should “give” with temperature changes in the pavement. The roadway loop shown here, on the right, is a typical configuration for a street or roadway installation. The loop shown is cut with a street saw with straight slots. The corners are cut with 45 degree cuts to prevent sharp corners. The two wires leave the rectangular loop and are placed in another slot to exit the roadway. The wires used in the main loop and the exit slot must be one continuous piece. No splices can be made in any part of the installation. The two wires are twisted around each other at least 6 times per foot and placed in the saw cut leaving the roadway. Apply sealant to this sawcut as well as the main loop. The wires are then spliced to the lead-in cable at the concrete pull box. All splices must be soldered! Do Not Use wire nuts or crimp type connectors! Tinned copper crimped connections can be used to hold the wires together as long as they are then soldered! Most parking and access control applications use unshielded, twisted lead-in cable. Many times the lead-in cable used, is the same loop wire twisted with a drill to produce at least the 6 turns per foot twist in the wire. All lead-in wires must be twisted to avoid cross-talk between two or more detectors! Twisting all detector lead-in wires for each loop will minimize other problems such as street loops that have intermittent shorts to ground and/or radio frequency interference from other devices not related to traffic control devices. Using lead-in wire that is twisted is even more important if lead in-wire from different loops are routed back to the detectors in the same conduit. The detail below, shows a cross section of the wire slot with 4 turns of wire installed. Notice the backer rod holding the loop wires in the slot. The sealant should completely fill the slot up to the surface of the roadway. The top of the backer rod should be at least 1 inch below the level of the pavement. Some years ago when detectors had limited sensitivity, people began experimenting with different loop configurations. Today we have a variety of loop shapes in use: rectangular, square, round, triangular and combinations of these. In addition, agencies have tried connecting multiple loops electrically in various series and parallel configurations. Several things must be considered when designing street loops for vehicle detection. The length of the lead-in cable will affect the overall sensitivity of the detection area. This is a consideration only for extremely long lead-in cables (from 500 to 1000 feet, or more). If the lead-in cable of a loop is only a few hundred feet, as is the case of most installations, then the sensitivity will not be adversely affected. Many of our detectors have a range of sensitivity settings which will compensate for even the longest lead-in lengths. The biggest inductance change that a detector will “see” is when the loop area is entirely covered by a vehicle. For traffic applications where the detection zone must cover a large area, the vehicle detector sensitivity adjustment may have to be increased slightly for loops which cover an area larger than the area of the vehicle. For example, in traffic applications, a loop which is 6 feet wide but 50 feet in length will be somewhat less sensitive to the presence of a small motorcycle than a smaller 4 ft. by 4 ft. loop. The detector sensitivity may have to be raised one or two levels for the motorcycle to be adequately detected by this large loop. Multiple loops are often connected to the same detector to provide a larger detection area. This practice can lead to sensitivity problems if the loop area is quite large. The same large area of detection can be obtained by connecting the loops to separate detectors or connecting a fewer number of loops to each detector. If multiple detectors, and multiple loops, are to be used for one detection area, it will be necessary to parallel the relay (or solid state) outputs together. Many of the Diablo Controls Inc. vehicle detectors are covered with United States Patent number: US 7,132,959 B2 – “Non-Interfering Vehicle Detection”. This feature minimizes the effect of crosstalk between street loops. Cross talk is the result of two or more loops or feeder cables affecting each other. Detectors experiencing crosstalk will usually intermittently pick up a false “detect” or worse, drop a “detect” when a car is indeed present. To minimize crosstalk possibility, the street loops should be placed as far apart as possible. A good rule is to place loops at least 4 feet apart. 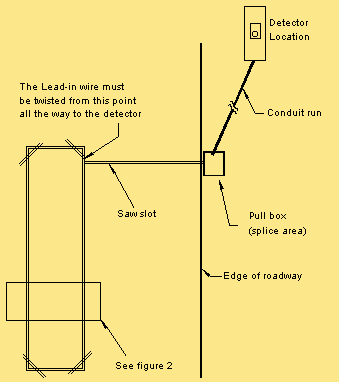 The lead-in wires from each detector must also be a twisted pair. Loops installed in the vicinity of swinging or sliding gates, need special consideration. The gate should not come closer that 4 feet from the loop at any time while it is closing or opening. Comparison between the EMX VMD202, and our VD909 mini-loop. These two devices work in quite different way. The VMD202 is a very sensitive magnetometer. It measures the flow of the earths magnetic field. Like water, flux follows along the easiest path. 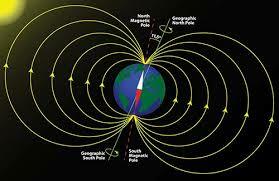 In the case of the earth’s magnetic field, it is from the North pole to the South pole. Normally, the flux flows evenly over a land with no metal in it. Where it encounters a ferrous metal object, the flux takesa short cut through the metal. The red line represents the VMD202. As you can see, by diverting the flux, the sensor gets a different reading of magnetic field. Now imagine the road going from east to west, not north to south. The magnetic field is disturbed, but in a completely pattern, and not as sensitive. As the car passes, the field drops, then increases, then drops, then returns to normal. Conventional detector loops are like the string on a musical instrument. They resonate at ultrasonic frequency. When a car drives over, the frequency drops slightly. It only applies to the immediate area of the loop. This is the same principle as the VD909 sensor, which has miniaturised the conventional loop by focusing the ultrasonics, a bit like a telescope. It is a more stable system than the measurement of the disturbance of the earths magnetic field. Movement of the VMD202 sensor will also cause false triggering, because the sensor is moved relative to the earth’s poles. Consider the two systems in the middle of a field away from any metal. Touch the VMD202 and it will trigger. Swing the VD909 mini-loop around your head and it will not trigger! In practice, try vibrating the ground over the VMD202 by stamping on it. The vibration may be enough to trigger the output. This cannot happen with conventional loop technology. You may have fitted a loop around a rising bollard. So long as the mass of the bollard remains within the perimeter of the loop, it is not sensed by the detector. Only a vehicle moving into the loop area increases the net ferrous mass. We have heard about these devices being triggered by a locomotive passing hundreds of feet away, even fast lorries on adjacent roads. Any movement of a ferrous material has a small effect on the direction of the flux flowing past. Loop detector technology is unaffected because it creates its own field, not measures and existing field. That is why our Dynamite mini-loop is so stable and successful. Our control module properly isolates the sensor from the electronics, and isolates the output from the electronics, so earthing has no effect on performance, and there is no need for a separate power supply. In brief, magnetic field disturbance sensors appear to be a convenient short cut to laying a conventional exit loop. However, any disturbance is likely to false trigger. The VD909 mini-loop has the convenience and the reliability.